On April 12, Professor FUJITA Seiichi, Executive Vice President in charge of Education, and Professor INOUE Noriyuki, Executive Vice President in charge of International Exchange, participated in the exchange meeting in Hanoi, Vietnam, with the Kobe University Alumni Association in Hanoi. Professor Fujita and Professor Inoue were visiting Hanoi for the signboard unveiling ceremony of the Kobe University Liaison Base. 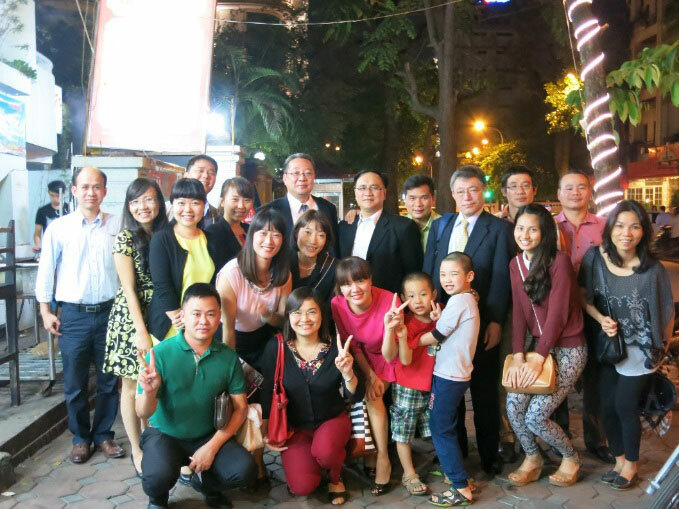 The last exchange between both Executive Vice Presidents and the members of the Kobe University Alumni Association in Hanoi took place at the Kobe University Global-link (KUGL) forum in December 2013. Approximately 20 alumni participated in the exchange meeting. Among the participants were Mr. Luong Van Khoi, President of the Kobe University Alumni Association in Vietnam, and Mr. Vuong Thanh Long, President of the Kobe University Alumni Association in Hanoi. The meeting started with President Khoi’s opening remarks and was followed by a speech from Professor Fujita regarding the establishment of the Kobe University Liaison Base in Hanoi. The members and both professors then enjoyed the reunion, updated each other about their status, and reminisced about their sweet memories. With the establishment of the Kobe University Liaison Base in Hanoi, it is expected that the international intellectual network will be further reinforced through conducting this type of exchange activity periodically and enforcing collaboration with the alumni association.